The Mexican hat dance has a very rich tradition. Joyfully characterized Mexican folk music is one of the most popular expressions of Mexican culture. Since ancient times indigenous groups such as the Aztecs and the Mayans performed dances to please their gods in special celebrations. At the beginning they were mostly ritual and secular dances, but thanks to European influence, Mexicans Mestizos and Criollos developed their own dance styles and created new rhythms. Normally played by folk bands or mariachi bands, Mexican music is such a spectacle for all your senses. Mexico's dancing culture is very diverse; influenced by the different states and regions. They all have a representative dance that characterizes them. Mexican dances are a form of expression and a way of life for traditional Mexico. Something important in a Mexican dance or music performance is the dancing outfit characterized by a typical Mexican look. This kind of dance is very old and it shows a confrontation between the evil forces and the good. Performed the day of the Virgin of Guadalupe December 12th and on San Francisco de Asis day on October 4th. Danza De La Guelaguetza o "Flor de Piña"
It is celebrated in the valley between the states of Veracruz and Oaxaca before the harvest season. The most well known version is performed by the Tarascos in the state of Michoacan dedicated to the old god, and the god of fire. 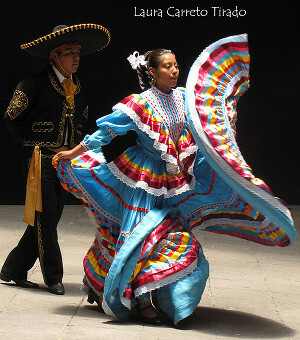 All Mexican dances are performed with typical Mexican rhythms and are the basis of the modern Mexican regional music and traditional performances. The typical folk music used in most Mexican dances is called "sones", and they are characterized by joyful music of true Mestizo origins. Jarabes is the name given to a type of dance characterized by flirting between a man and a woman. The music is interpreted by a band with guitar, violin, cajon, cantaro and coffee leave which produces a sound similar to the saxophone. The sones have instrumental parts when the couple performs intense shoe movement and then a part when the couple dances softly and change positions. The Mexican hat dance or in Spanish, El Jarabe Tapatio, is the most famous Mexican dance of all, and as expected, it has an amazing and joyful music. The music and the dance were made famous in the twentieth century when it was played to commemorate the successful end of the Mexican Revolution. Since then, the music for the Mexican hat dance has become very popular in Mexico, the United States and all around the world. The original music is a mixture of different sounds and Mexican melodies (sones) which together form the national dance. Here are some of the most typical sones used: "El atole" and continue with "The Carbonero", "El Sombrero ancho", "El Ahualulco", "La Malhora", "La Guitlacocha", "El Perico", "El Romerito", "El Limoncito" and other different melodies to end up with "The Palomo" and "La Diana". The music is mostly performed by a mariachi band to keep the tradition. The dance is about flirtering and courtship and it can be performed by a couple or in groups of couples. The dancers are the typical Mexican characters the Charro and the China Poblana wearing both elaborated and fancy costumes. The men try to impress the women with his stamping and his manhood. At the end, the man succeeds in conquering the "China" throwing his overhead hat and kissing the woman. Mexican dances especially the traditional ones, have a special charm and posses a lot of history behind them. And these make them such a creative expression of the culture. Today Mexican dance is a symbol of National pride and honor of the Mexican people. People dance proudly to celebrate this tradition, enjoying every movement.